What's Eating Jdavies? : Googling "Marketing"
The Wikipedia entry on top. 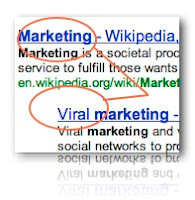 Google has 'Viral Marketing' as the second most relevant term. Does your product have a wikipedia entry? The wikipedia community will take down any biased posting, but if you would like a historical placement on your company, this maybe something to look at, not for marketing but for PR. Have you implemented any Viral Marketing Program? While not a requirement, and such a strategy maybe applicable to certain markets only, if google has it on top, shouldn't you be considering it if you have online presence? Hmmm... I am not familiar with Viral Marketing... you know what? We did try to put up a Wikipedia page for our company one time but no sooner were we done with it than it was deleted. We will try to do it again using your approach.